For those wanting the look of a clean, neat, striped and manicured lawn, then mowers are an absolute must. However, when the wide cutting widths of zero-turn mowers are overkill for your relatively small yard, then you might fare better with an efficient push-reel mower. Not only will you get a more compact mower that needs no fuel and subsequently emits no harmful fumes, but you’ll also be mowing your lawn in peaceful silence. 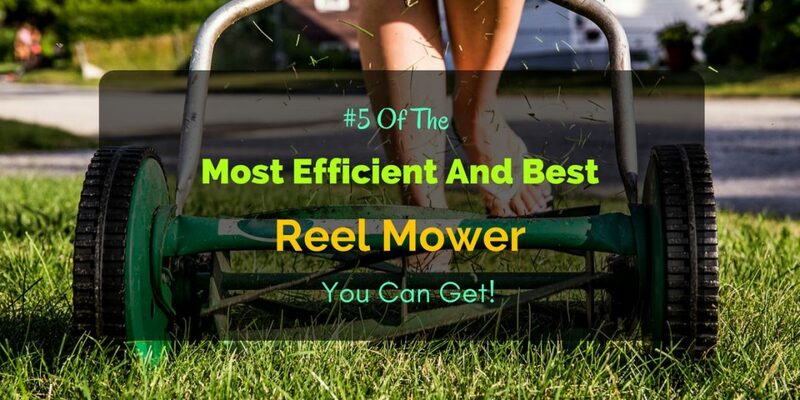 Hence, if you’re looking for your next mower, make sure you get the best reel mower. I’ve reviewed five of the best; from a small 14-inchmower to a big 18 inch which will be perfect or small to medium-sized properties. Take a look at them below as well as a helpful guide to choosing your next mower! You might hear reel mowers referred to as cylindrical lawn mowers. Don’t worry; they’re one and the same. Their names come from the particular kind of cutting system they employ to mow blades of grass. Z-turns and motorized walk behind mowersmight, for example, use a horizontally spinningblades to cut grass. However, reel mowers mow grass via a set of helical blades revolving vertically and cutting against a stationary bedknife. Therefore, you may conclude that motorized mowers cut grass like a spinning knife, while reel mowers cut very similar to scissors. The blades are then spun into motion by pushing the mower forward sending momentum from the wheels into the blade reel. There isn’t necessarily a better option with areel or motorized lawn mowers as they both have their specific uses primarily in the size of your lawn. Naturally, bigger lawn mowers will be more productive with large properties. However, a reel mower does present several significant advantages over their bigger automatic counterparts. One of the top advantages of reel mowers over their motorized kind is their blade design. The helical vertically-spinning blades cut grass much more precisely as opposed to the shredding nature of the blades in motorized lawn mowers. And as you may already know, cleaner cut grass will result in a healthier lawn. There are a few things as discouraging to garden maintenance than a bad pull-starter. However, with a manual reel mower, you don’t have to worry about engines, pull-starts, or mixing the right amount of oil and fuel. Additionally, the lack of these components makes reel mowers easier to maintain. Since it’s your muscles that power the reel mower, you do not add any harmful emissions through the air as would a lawn mower with an engine. Another advantage of an engine-free mower is the lack of noise. So, in addition to clean cut grass and equally clean air, reel mowers help you focus on the task at hand without distraction. Reel mowers range from weights of 19 pounds up to 50 pounds. This relatively lightweight in comparison to motorized lawn mowers and z-turns make manual reel mowers very easy to use and maneuver. It goes without saying that with any garden tool, durability and quality should always be top-notch, so you’ll be getting the bang for your buck. Hence, before check the specific featires, you should first ensure that the reel mower ranks high in build quality and toughness. The wheels on a reel mower give you both traction, control, and maneuverability. Bigger wheels will typically mean you’ll be able to cut grass at a better height while smaller wheels may limit you to a grass-cutting height of 1 ½ inches. Although the number of blades would usually mean faster and more efficient mowing, you should also consider how their blade reels are constructed. For example, a useful feature to look for is blade reels with ball-bearings. The ball-bearing construction minimizes friction between the moving parts of the blade and the body of the reel mower. Hence, it makes it easier for the blades to spin with little effort and to continue turning for much longer. Looking into a reel mower’s cutting specifications will need some planning. Most importantly, consider the size, and shape of your lawn; your preferred grass height; as well as the frequency as to which you usually mow your lawn. Naturally, smaller cutting decks will be ideal for small lawns. Meanwhile, reel mowers with high cutting decks will be best for yards that sport taller grass or if you less frequently trim your lawn. Finally, you should consider the overall weight of your next reel mower. Since we all have different strength and stamina levels, choosing the right mower with a weight appropriate for you will make for a more enjoyable task of maintaining your lawn and keeping your grass healthy. If you’re looking for an entry-level and extremely affordable reel mower, then look no further than the 14-inch, 4-blade reel mower from American Lawn Mower company. Weighing in at 19 pounds, this reel mower will be a breeze to use. However, it’s price and weight doesn’t mean you’re getting an inferior design. On the contrary, this reel mower sports a tempered alloy steel reel and bedknife blade. Another reel mower from the American Lawn Mower Company comes in the form of the7-bladed machine with a 16-inch wide cutting deck. Effectively the big brother of the previous reel mower on our list with its larger 10-inch wheels and higher quality blades. Weighing in at 28 pounds, this reel mower has a maximum grass cutting height of 2.25 inches. Get this mower, and you’ll be able to quickly and cleanly cut grass, keeping it healthy and free of disease. Also, it’s many blades, and smooth ball-bearing design means there’s little need to redo patches of uncut grass. Another affordable entry on our list is the 14-inch Great states reel mower. It weighs just a pound over the 4-Blade 1204-14, but sports higher quality polymer wheels and a smooth spinning blade reel. Additionally, the Great States 204-14 features a similar durable steel alloy frame putting its durability on top. Although 4-Blade 1204-14 and Great States 204-14 are both entry-level mowers, the 4-bladed Great State mower wins out on wheel quality and top-notch blade movement. The low blade count means that you may need to redo some patches of grass. A bigger and more powerful version of the Great States 204-14 is the 5-bladed Great States 415-16 with its 16-inch wide cutting deck and large 10-inch ball-bearing wheels. Most noteworthy, though is this mower’s heat treated blades that will keep its edge for much longer in comparison to other reel mowers. Lastly, the Great States 415-16 sports one of the highest cutting heights, which ranges from 0.50-inch up to 2.75-inches. Heat-treated blades stay sharp for extended uses as well as increase durability. Extra care must be taken especially in blade lubrication after every use. Finally, we get to my favorite reel mower: the Staysharp 6201. In fact, just one look at this reel mower and you’ll see that it’s not your ordinary grass cutter. This mower is, arguably, the most advanced reel mower on the market. Looking for blades that will last 5 or even up to 10 years before needing any sharpening? What about a wide cutting deck of 18 inches as well as a cutting height of up to 4 inches? Or how about a reel mower with twice the cutting power, that cuts through thick weeds and tough spots where other reel mowers fail? You’ll find all these features and more in the Staysharp Max Reel mower from Fiskars. Reel Mowers vs. Rotary Mowers: Which Does A Better Job?